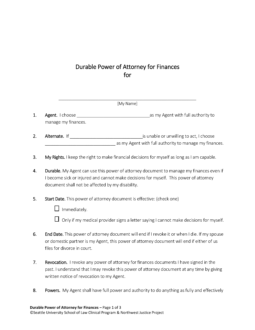 Washington Power Of Attorney Forms provides the paperwork (oftentimes) legally required to appoint another person to act in your name and on your behalf. There are times when you may be unavailable to handle your own affairs, or you may have become legally incapacitated and unable to make your own decisions. At such times, life and responsibilities will still go on. This paperwork can serve as a precaution that your responsibilities will still be fulfilled by someone you have chosen. In some cases, this may be a qualified professional (i.e. when naming a tax representative) while in others it may be a relation (i.e. naming a child’s temporary guardian). In any case, the form is used and the agent being chosen should both be appropriate to the subject matter-at-hand. You can choose to appoint an agent to handle only one or two financial matters, real estate purchases, tax filings, or give a broad scope of authority to an agent based on whether or not you are incapacitated. All such delegations of authority must be signed by the principal issuing the document. 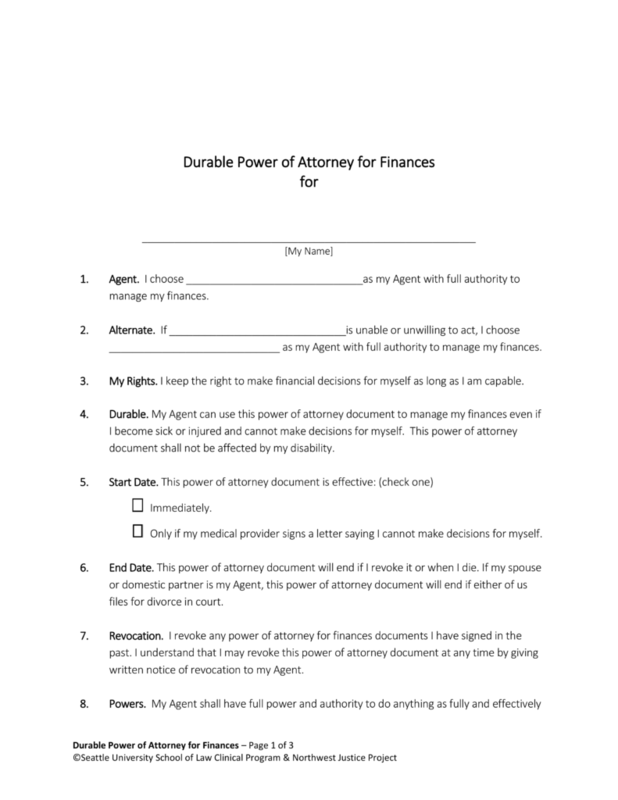 Durable (Financial) Power of Attorney – This type is generally used for long term estate planning as it remains in effect even if you become incapacitated. It allows you to grant general financial powers to another. Durable (Health Care) Power of Attorney – This type of POA is for appointing a loved one to make health care decisions on your behalf if you are unable to communicate your wishes to your health care providers. General (Financial) Power of Attorney – This type also allows you to grant another person general financial powers, but it terminates if your doctor has indicated that you no longer have the capacity to make reasonable decisions. Limited (Springing) Power of Attorney – This type is for limited circumstances and can be tailored to suit your needs. Guardian of Minor Power of Attorney – Allows another individual to take care of their child and make educational and/or medical decisions. Signing Requirement: It is suggested that the document is signed by the caregiver, a notary public, and two (2) or more witnesses. Real Estate Power of Attorney – Also referred to as a “Special” power of attorney document for the handling of another’s real estate holdings in accordance with § 11.94.050. Revocation of Power of Attorney – This form is for revoking any type of POA that you may have entered into previously. Signing Requirement: No legal signing requirement; however, it is recommended that the document is notarized. Tax Power of Attorney Form – The State of Washington recognizes the Federal Tax Form 2848 for all power of attorney tax purposes. Vehicle Power of Attorney – This form is for handling matters involving motor vehicle transfers or registration and titling in the State of Washington.